Yes, we still call it that. We spent the last weekend in Bombay (or Mumbai to whom the old name doesn’t appeal). The nature of our work there left us with much free time so we decided to do the next best thing – scour for books. We spent some time at the Strand Book Stall, which, crowded and cramped as it is, still continues to amaze with its sheer selection of books, and at the newly opened Kitab Khana, which is situated near what used to be simply called Fountain and is now called Hutatma Chowk. Kitab Khana is an amazing place for bibliophiles. Seems like the owners have deliberately chosen not to have the bookstore crammed with shelves, instead allowing visitors to move freely within the store. 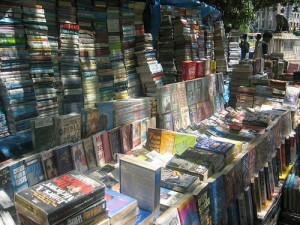 The books stocked are also of a different variety with more attention being paid to Indian literature. Some books not usually found, like the Paris Review Interviews, are also available here and should delight a bibliophile no end. Unlike the Strand, Kitab Khana offers good discounts to buyers. Given the time we had to ourselves to just roam around we chanced upon a group of 5-7 hawkers, not too far from KitabKhana itself, selling what seemed an excellent collection of used books. These guys know their books and it seems like the knowledgeable book buyer will get what he/she is looking for. Between there and a similar place in Matunga, we found copies of Zadie Smith’s On Beauty and The Autograph Man and four volumes (out of six) of Winston Churchill’s books on the Second World War. All for Rs. 400. Given that these books couldn’t be found at any regular book store, it was a delightful experience finding them. Many such books rarely available at bookstores, or even online, could be found here. Which brings me to my point. Bookstores still have a future. The ease of making a purchase online notwithstanding, and the large discounts available there, bookstores allow one the experience of leafing through the pages, the convenience of comparing two texts to find what you are looking for (especially where non-fiction is concerned), the ability to gauge the quality of the pages, the fonts and the readability in general and the comfort of just being able to browse through spines and look for a title that interests you. If bookstores ever triggered an impulse purchase it had to be its brick and mortar variety. To make the book buyer’s experience more enjoyable though, bookstores will have to be more than just shelves with personnel milling around. Attendants will have to be knowledgeable about books and be able to guide the buyer on that journey called book buying. The store itself will have to allow for lazy reading and comfortable browsing. A hurried environment just won’t do.